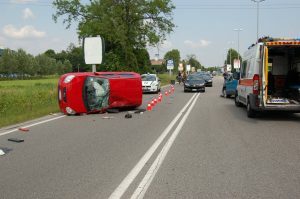 Car accident scenes are often mysterious at first glance. On July 22 at 7:30 a.m., a mother and her three young children traveling in a Pontiac Grand Am veered off the 605 South in Bassett, flipped over, and struck a tree. The 30-year-old mother and the 7-year-old sitting in the backseat were instantly killed in the crash. Firefighters freed a three-year-old and an 11-year-old, who sustained critical injuries in the crash, and transported them to a trauma center for treatment. Their identities have not been released. Witnesses are asked to call law enforcement with any information. What happened? Who is liable? While the investigation is in the earliest stages, San Gabriel Valley Tribune reports that drugs and alcohol are not suspected as factors. A solo car crash where the driver has been killed is not always an open-and-shut case. In some cases, the driver may be found liable for speeding, driving distracted, or falling asleep at the wheel. Was another driver at fault? Sometimes eyewitnesses come forward and another driver is identified as contributing to the collision. Experienced car accident lawyers can build a strong case against a driver who cuts another car off, causing them to skid off the road and crash. If a driver has breached any of these duties, he or she may be found “negligent” in a court of law. Damages may be awarded to another party for medical bills, property damage, lost wages and income, disability, funeral expenses / wrongful death, and emotional pain and suffering. The Ellis Injury Law Firm has a vast network of crash scene investigators who will work hard for your family when it seems police inquiries go nowhere. We have recovered over $350 million for our clients, including settlements over $1 million for car accident injuries and wrongful deaths. Legal assistance costs nothing unless the lawyers take on your case and win compensation, so there is no harm in calling 310-641-3335 for a free consultation.